This all-inclusive, full-day Kentucky bourbon tour visits three different Kentucky distilleries for an amazing 10-hour bourbon experience. 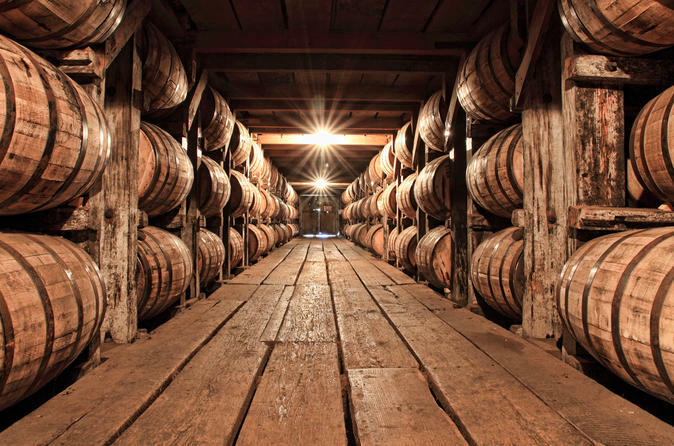 Experience three of the top bourbon distillers in the industry: Maker's Mark, Jim Beam American Stillhouse and Heaven Hill. With your professional guides, just sit back, have fun, and enjoy your fully-guided day exploring Kentucky. Tour departs from the Mint Julep Tours gift shop in the Galt House Hotel in downtown Louisville at 8am. You'll travel in a comfortable luxury bus while your tour leader teaches you about Kentucky and its distillery history on your way to the first stop, Maker's Mark Distillery in Loretto, KY. There you'll tour the grounds learning how Maker's Mark bourbon is made. Your guided tasting experience will include samples of Maker's Mark, Maker's 46 and other products made on-site. Next up, you'll enjoy lunch at a local restaurant (location varies) before heading to Heaven Hill Distillery's Bourbon Heritage Center. Enjoy a guided tasting of Heaven Hill products (tastings may include Larceny, Evan Williams or Elijah Craig bourbons) and visit the gift shop before boarding the bus for your next destination, Jim Beam. Jim Beam American Stillhouse is the home of popular bourbons and American whiskeys including Jim Beam, Knob Creek, Basil Hayden's, Baker's and Booker's. You'll learn their process from mashing to distilling, barreling, aging, and bottling. Finally, travel back to Louisville, returning to the Galt House at approximately 5:30pm. Your ticket includes transportation with an expert guide, admissions for distillery tours with tastings at Maker's Mark and Jim Beam American Stillhouse, a special guided tasting experience at Heaven Hill Bourbon Heritage Center, lunch at a local restaurant, and bottled water. Lunch location varies.